Source: Journal of Environmental Management, 231:1263-1269. | January 28th, 2019 | By SI Bouhadjar, H. Kopp, P. Britsch, et al. A holistic, innovative and feasible concept for removing fluoride from groundwater. Modular, low energy and low cost nanofiltration technology for fluoride removal. No waste streams due to use of concentrate (washing, toilet flush, etc.). Energy autonomy in power supply (PV), no grid access is required. 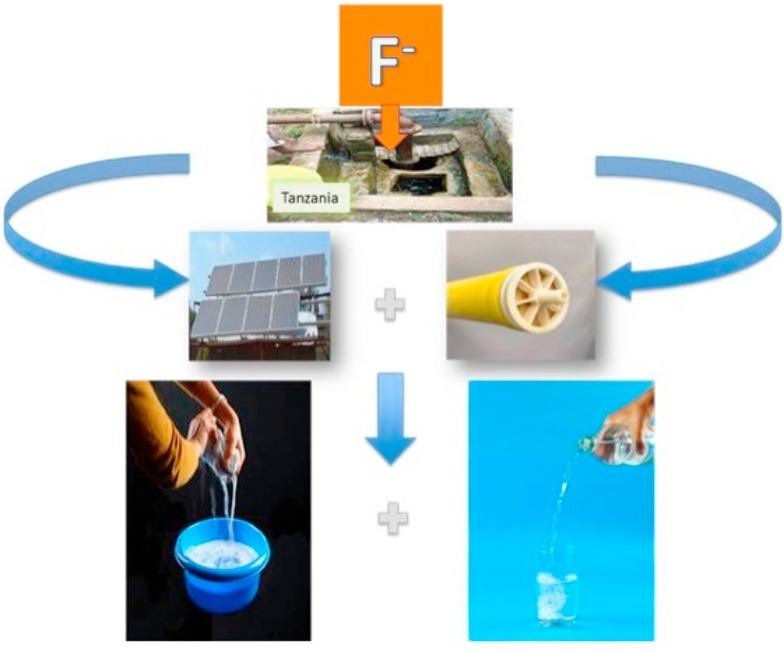 The following paper summarizes the findings of a pilot study to develop a simple, low-cost, holistic water concept on fluoride removal from groundwater in rural communities of Tanzania; an ideal representative community for other areas in the world with similar problems. A small photovoltaic powered nanofiltration (NF) pilot plant was installed at a vocational training center in Boma Ng´ombe in northern Tanzania. The groundwater in this region is contaminated with fluoride at very high concentrations of up to 60?mg/L. The pilot plant was equipped with a single membrane module containing a spiral wound 4040 membrane NF90 of Dow Water & Process Solutions and was successfully operated over a nine-month period. The membrane removed more than 98% of fluoride. In fact, the fluoride concentration in the permeate was always less than 1?mg/L, which is in agreement with the WHO recommended standard (1.5?mg/L). Permeate was also used as weekly flush medium, so no chemical cleaning was required. Aside from permeate (drinking water) concentrate was also used for washing and flushing the toilets. In conclusion, the use of solar PV power (2.25 KWP) for approximately 2.5?h per day allowed producing about 240?L/h of permeate on average. Therefore, the sustainability of the process and suitability for the Tanzanian communities was proved.